Buford Betty: Vera Bradley Giveaway - LAST chance! One last reminder that my fabu Vera Bradley Giveaway ends today! Get those entries in by 5 o'clock (EDT) by clicking over here... hop to it! My goal is to get on here later tonight with the winner since tomorrow's going to be so crazy with our July 4th plans. Back soon! Happy 4th of July!! Hope you have a great holiday weekend. 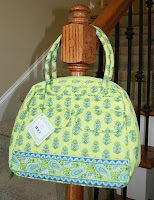 I love this Vera bag you've decided to giveaway! I hope that you had a great 4th!